Last week at the Xebicon conference in the Netherlands we presented different setups of Product Owner teams, using 3 models. We talked about Product Owner teams, as in most cases the Product Owner role is not executed by just the Product Owner person. He (or she, of course) organizes help from others to fulfil this exacting role. 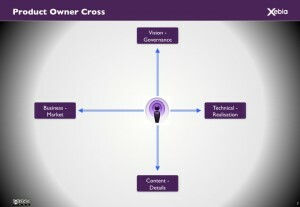 The Product Owner role encompasses many different activities. The following model distincts 8 areas. To perform these activities requests a double stretch. The first one is between knowledge and interest of the business domain to knowledge and interests of the technical solution domain. 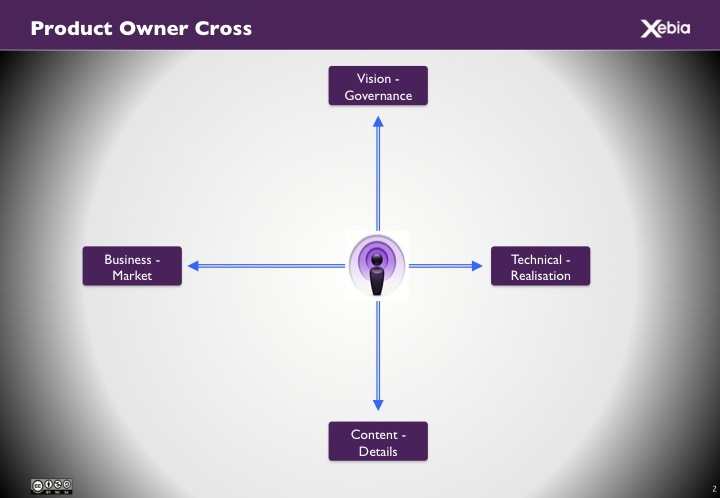 Of course the primary focus of the PO is in the business domain. But to understand and discuss functional issues arising from technical challenges a PO can not simply stay away from technical basics. The other stretch a PO has to make is between vision and governance competences and the specification of requirements in detail. In an ideal Agile world the perfect Product Owner person has it all and does it all, with the help of his delivery team now and then. In real life practices we see the need for a Product Owner team. Partly to compensate for some hopefully temporarily omissions like part-time availability, insufficient empowerment or insufficient competences. But also to deal with the complexity of organisations, with polyphonic business units and complex, very specialized resources and multi-supplier development chains. Whether a Product Owner completely covers this spectrum is not just a matter of competences but also of his own passion and the complexity of the organization. 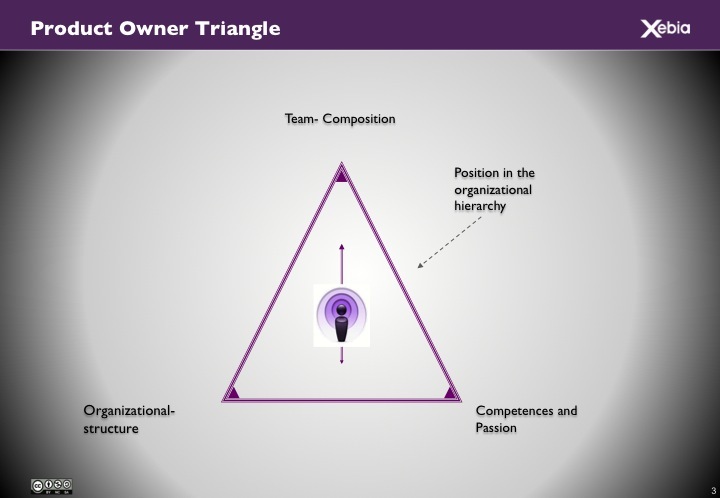 Furthermore the composition of his team(s) and his position in the organisational hierarchy determine the range of the Product Owner person, and the areas he is likely to fall back on others. An analysis following the next model helps to identify the product owner strengths and challenges. At the congress we explained how one uses the insights from this analysis to start plotting the product owner person in the first two models, identifying competence areas where this product owner needs support. 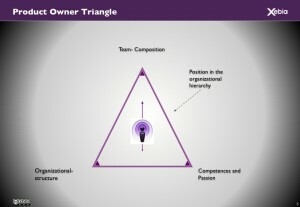 Your start to compose the product owner team. The setup of the Product Owner role in an organisation requires a custom made solution. Helping hands, formally in a ‘Ready team’, or informally by ad-hoc resources, usually will surround the Product Owner. 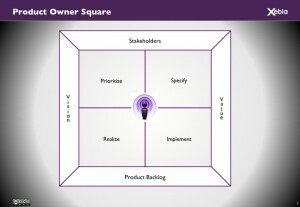 The ‘square’, the ‘triangle’ and the ‘cross’ help you identify how to compose your Product Owner team. Impact: Product Owner must ensure decisiveness and power. Without these there cannot exist effective Product Ownership. In a next blog I will use these models to discuss some common Product Owner types, and the typical teams that arise around each of these types. Cost Effective, Fast and Scalable: Is It Time You Considered Automated App Deployment? I like what you are saying about the role. One quality I believe is consistent across a number of successful product owners is passion and energy for the product (or customer in our case). This passion must of course be present across the whole team, but if there is one person who’s lack of passion will kill an agile effort, it is that of the PO. Recognizable, looking forward to the next blog.